"So my coworker got a new Corvette a few weeks ago," reads the opening of this thread on NASIOC. And the accompanying picture is just perfect. I'm not particularly surprised by user ihadmail's post that 'ditches love Corvettes,' mostly because this is a rear-drive car 460 horsepower and 460 lb-ft. of torque. An rear-drive car with that kind of power is going to find itself oddly attracted to undesired offroading. 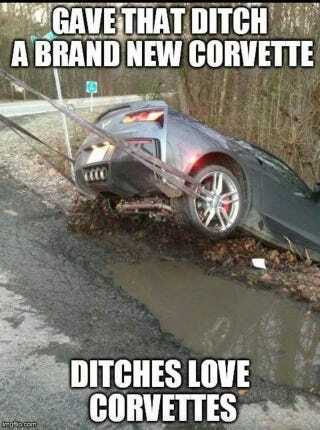 That and I know from experience the 2014 Corvette spins its tires in the cold even with traction control very much on.